Happy 2017! Although if you’ve been keeping up with the national news, not so happy for a lot of us. Anyhoo… we’ve had a warm-ish January with almost no snow. It finally snowed again last night and has been lightly snowing on and off all day. Like I always say, if it’s going to be cold, let’s get some snow up in here. It makes the cold bearable. 1) I was so happy to attend the Women’s March Detroit on the 21st. I was considering not going, but ultimately needed to do it for my kids. Not surprisingly, I didn’t know anyone in town who was going, so I checked in with my sister-in-law, who wanted to go. It was such a positive and invigorating experience and I felt very proud to be there. I took a bunch of pictures and will share them all in the next post. 2) After the March, we went to The Farmer’s Hand in Corktown for lunch. I have been dying to go – Detroit Abloom sells our flowers there and I’d just heard it was a cool spot. It’s smaller than I pictured, but it was packed with plenty of goods, all made in Michigan. I had a salad and a yogurt cup with chia, and also picked up a jar of marinara. Love Ouizi’s murals. If you don’t know her work, give her a Google. 3) Our sweet boy turned 11 on the 6th. The girls made cards for him and we sang Happy Birthday and gave him a Kong toy filled with peanut butter, carrots and celery. 4) And then….this weekend we found out he has a tumor in his mouth, which had to be operated on right away, which happened to be yesterday. We are still awaiting biopsy results, but it doesn’t look good. He is never allowed on the couch, but after some begging from me (and the dog), my husband agreed to let him rest off his surgery on the couch, where he is now with our little one, who is also resting after 24 hours of the stomach flu, oh my gosh. 5) My husband went to a sausage-making party (indeed) at the beginning of the month and came home with a ton of deliciousness, some of which I sauteed with marinara sauce and a heavy dose of cream because cream. I did pour the concoction over zucchini noodles, so there. 6) Winter sunrises are always the prettiest. Or maybe it’s because I’m up too late in the summers to see them? I can never capture their magnificence on film, but here they are, anyway, to give you an idea. 7) I started yoga again. Ouchy. 8) For Martin Luther King Jr day, the girls and I talked about acceptance, appearances and kindness. We did an art project together inspired by quotes from Dr. King. I haven’t been very good at things like this (projects in general) lately, but it was really fun and they really got the point of it. 9) The Garden Detroit held a board meeting this month at Tom and Nancy’s house. We’re never all in the same space that often, so it’s always nice when we are. At the end of the meeting, we started talking about moringa trees, which got us talking about moringa seeds and then Nancy brought some out for all of us to try. I do not recommend eating moringa seeds. The taste is a heavy sweetness paired with a very tannic bitterness. Kind of like eating mud mixed with corn syrup mixed with gasoline mixed with dog food? And the aftertaste stays with you for a loooong time. They are supposed to be incredibly healthy for you, loaded with vitamins A and C, iron, protein, calcium and potassium. Pretty impressive, but still. 10) I have been wanting to check out Wright and Co, a now not-so-new spot in downtown Detroit. We stopped in after dinner with friends one night for drinks and dessert. It was packed. Fun atmosphere, somewhat noisy and the couple plates we tried were yummy. Detroit’s culinary scene continues to boom. It’s a great time to be here. Oh and haven’t you heard? Detroit was recently named as the number 9th best place to go in 2017 by the New York Times. So come visit! 11) Work at the school is picking up, as we are gearing up for the annual auction. I went with our team to edmond t. Ahee Jewelers (everyone here just says Ahee) to pick out pieces for the live auction. Besides the beautiful jewelry, there was a treat and coffee station at the back of the store, which apparently is always stocked. Super cute. And tasty. 12) I’ve been on a murder mystery kick, as I think I mentioned last month. 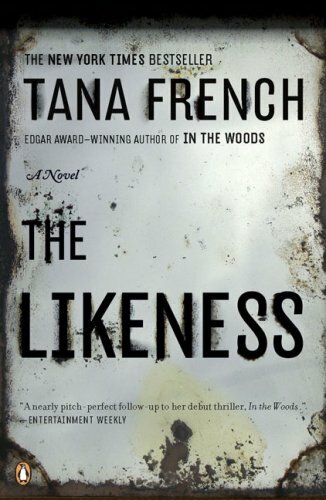 I asked for recommendations and my friend Deanna said author Tana French, which coincidentally I had written down as a maybe on my book list, so I borrowed “The Likeness” from the library. It’s the second in her Dublin Murder Squad series, but I was reluctant to read the first, as the subject matter is very dark – dead children, the deep dark woods, etc. I’m halfway through and the writing is really good, especially for a plot-driven genre, and the characters are interesting and complex. Q: What is a ghost’s favorite body part? Have a great February, all! This entry was posted in Detroit and tagged Book, Detroit, Grosse Pointe, Journal, Michigan, Musings, Personal, Women's March. Bookmark the permalink. The sausage marinara sauce looks delicious. Only L will eat the zucchini noodles! But at least that’s one out of two. So much better now, thanks! A joy to read as always Lani. Sorry to hear about Sammy boy. Praying he is going to be right as rain. So cute to see he’s taking care of the girls. I love your photos and seeing a glimpse of Detroit Suburbia. Hope to see in person one day. Miss you Dear friend! Thanks for the book recommendation; I’ve been on a mystery book kick myself! Just started ‘Slow Horses’ by a British author that is the first of a trilogy. Heard about it on NPR. A great read so far! Cheers Bella! Thank you!! How we love our sweet animals, they are so good to us. Thanks for the book recommendation, I will check it out! I have another series for you – Dutch? Swedish? – I’ll email you. x.o.